On March 27th, Dubspot Labs Director Adriano Clemente hosts a free workshop with producer and synth creator Gavin Russom (DFA) for a discussion on creative strategies, workflow, and production techniques. 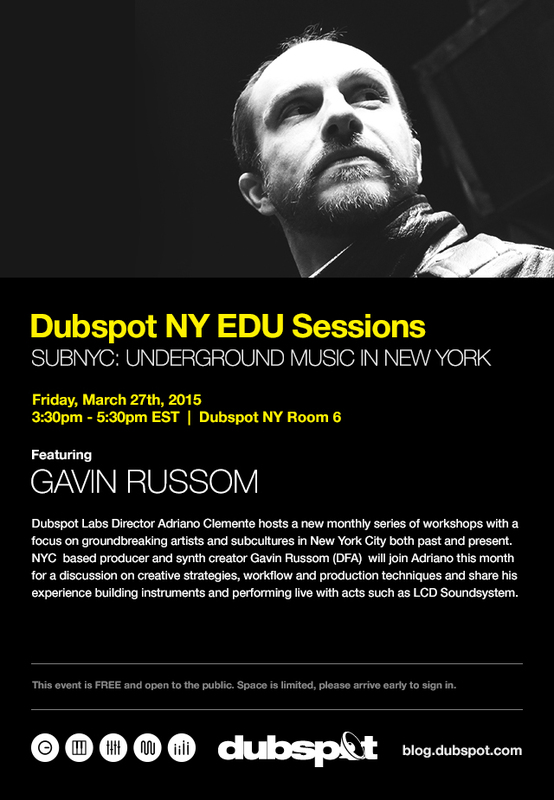 Dubspot Labs Director Adriano Clemente hosts a new monthly series of workshops with a focus on groundbreaking artists and subcultures in New York City both past and present. NYC-based producer and synth creator Gavin Russom (DFA) will join Adriano this month for a discussion on creative strategies, workflow, and production techniques. In addition, he will share his experience building instruments and performing live with acts such as LCD Soundsystem. Gavin Russom is a composer, artist, DJ and producer of electronic music. Originally from Providence, Rhode Island, he currently lives in New York City. He has also spent a significant amount of time based in Berlin which he considers his second home. From an early age, he became interested in experimenting with sound, image and movement and investigating the territory where the boundaries between them blur. Not surprisingly, his career has straddled many worlds and scenes. Looking beneath genre and the shifting landscape of stylistic trends, Russom’s focus is really the vital energy present in all earthly things and the ecstatic nature of reality. As a result his creative output, an attempt to continually liberate and channel these energies, often overlaps one medium with another yet still represents a remarkably consistent vision. He has exhibited visual artwork, which often contains a sonic component or references music, in galleries and museums all over the world including MOMA PS1, The Migros Museum and Galleria Fonti. As an electronic musician he has produced numerous releases on New York’s DFA label including “The Days of Mars” and “Black Meteoric Star”, also creating many of the visual elements that accompany them. At the core of his work are electronic instruments he designed and built himself as a way of deepening his creative process. This practice, as well as his prowess at programming analog synthesizers, led him to become the in-house electronics expert at DFA’s studio from 2001-2004, and to tour with the label’s most acclaimed act LCD Soundsystem on their 2010-2011 farewell tour. In 2009 he began The Crystal Ark, a collaborative music and performance project with filmmaker Viva Ruiz. The group released their debut LP on DFA in 2012 and has toured extensively as a 5-10 piece multi media ensemble since then. He has produced remixes for a wide array of artists including Cut Copy, Caribou, HIM, Planning to Rock and Kris Menace. This year he released “The Purge/Enthroned” on the UK based Entropy Trax label. It is the first in a series of experimental dance floor 12″s that he will do with the label.